There is a printable bus schedule PDF on the SFUSD web site. 9:00 am Starr King @ SB Wisconsin St.
3:35 pm Harvey Milk Elementary @ 200 Collingwood St.
3:44 pm Columbia Park Boys Club @ 450 Guerrero St.
3:56 pm Starr King @ SB Wisconsin St.
5:10 pm Harvey Milk Elementary @ 200 Collingwood St.
5:18 pm Starr King @ SB Wisconsin St.
5:31 pm Malcom X @ 350 Harbor Rd. 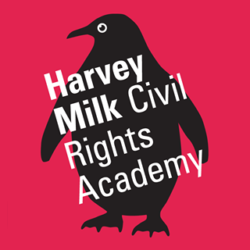 Located in the heart of San Francisco’s Castro district, Harvey Milk Civil Rights Academy is served by many major transportation lines. Muni Metro K, L, and M drop you off at Castro and Market streets just three blocks from the school. The 24 Line stops at 19th & Castro, one block away. The 33 Line stops at 18th & Diamond, one block away. The 37 line stops at Market and Castro, three blocks away. Many others are within a few blocks. Visit 511.org or nextbus.com to plan your transit.